Under Construction in Bright Sunlight. OCALA, FLORIDA, January 29/Internet/ -- Antennas for Communications (AFC) announced today that it was awarded a contract with Mcclellan Air Force Base for the design, manufacture and installation of a 110-ft. (35.5-m) diameter radome at Vandenberg Air Force Base, California. The Vandenberg radome is a thin membrane wall dielectric space frame (DSF) with geodesic geometry. Of great importance to the Air Force, the radome will be fabricated with AFC's impedance matching technology to drastically reduce the transmission loss associated with scattering off the radome panel flange framework. Radome impedance matching significantly improves system performance for radome protected antennas. AFC manufactures the radomes for the worldwide Defense Satellite Communications System commonly known as DSCS. "While AFC has been supplying radomes to the US Government for over a decade, we welcome the opportunity to furnish the Air Force with the latest technology advances in radome engineering" said Dr. Ronald S. Posner, AFC's CEO. "Dielectric space frame radomes with impedance matching technology offers both improved performance and cost containment unmatched by any other technology. We welcome the continued trust shown by the US Government and military for AFC's products and engineering advances." 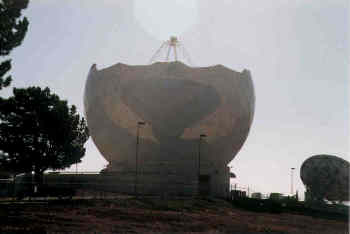 110-ft. (33.5m) Diameter Radome Under Construction. Antennas for Communications manufactures satellite and terrestrial antennas, radomes, microwave and waveguide components and ultra low loss waveguide transmission line Tallguide ®. The company serves the satellite, broadcast, communications, cable, radar, weather and government industry worldwide. For more information on AFC's radome product line, please refer to AFC's Radome Network Home Page on thin membrane wall, solid laminate and 3-layer sandwich radomes. A complete Internet WWW AFC document index may be found in Antennas for Communications (AFC) Home Page Document Summary List.